There are four techniques that can be effective in removing resident Canada geese, habitat modification, physical removal, repellants, and harassment. A permit through U.S. Fish and Wildlife Services is needed in order for anybody to remove Canada geese because they are still considered a migratory bird. Federal law prohibits individuals from possessing, transporting or handling migratory birds without a permit. The most common technique used in physically removing geese is a round-up. Round-ups are typically done in June or July when the geese are in their summer molt. At this time the geese cannot fly and will congregate in large numbers close to water to easily escape danger. Their inability to fly makes capture into funnel like traps easy. The second and our most common method is repellants or harassment. Harassment is the first method that must be tried before actual physical removal can be used. There are a number of ways to harass geese, but the most effective is the repellant FlightControl® PLUS. Habitat modification can be very effective if the end result makes the areas that the geese reside in less desirable to them for food and nesting. For more information or a consultation on resident Canada goose removal, please Contact Us so that we can give you the information you need that best fits your problem. Your Wildlife Professionals, Inc., can design a geese control, geese removal, or get rid of geese by treating the turf area with FlightControl® PLUS to remove pest geese in the counties, cities and towns of Alexandria, Arlington, Bedford, Blacksburg, Bristol, Charlottesville, Covington, Chesapeake, Danville, Fairfax, Fredericksburg, Hampton, Harrisonburg, Lexington, Lynchburg, Loudon, Manassas, Martinsville, Newport News, Norfolk, Richmond, Roanoke, Smith Mountain Lake, Staunton, Virginia Beach, Waynesboro, Williamsburg, Winchester, Wytheville, and Yorktown Virginia. For a FlightControl® PLUS treatment quote or other geese removal options, please contact Your Wildlife Professionals, Inc. for a bird consultation. Urban parks, residential landscapes, and golf courses offer the ideal habitat for the geese to reside. 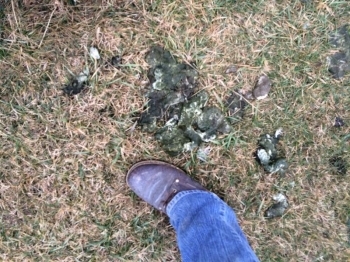 The droppings from the geese become a problem when several geese are residing for a long period of time. The droppings make use of the parks, yards, and golf courses less desirable to the individuals that use them. The droppings are unsightly and will gather on the shoes of the individuals walking around these areas. While there is considerable debate over the health threat of resident Canada geese, as to the disease to human contact with goose droppings, it would be expected to increase with increased goose populations. If Your Wildlife Professionals, Inc. can help prevent geese damage by providing geese removal or get rid of geese on your property in the counties, cities and towns of Alexandria, Arlington, Bedford, Blacksburg, Bristol, Charlottesville, Covington, Chesapeake, Danville, DC, District of Columbia, Fairfax, Fredericksburg, Hampton, Harrisonburg, Lexington, Lynchburg, Loudon, Manassas, Martinsville, Newport News, Norfolk, Richmond, Roanoke, Smith Mountain Lake, Staunton, Virginia Beach, Washington D.C., Waynesboro, Williamsburg, Winchester, Wytheville, and Yorktown Virginia, we are here to help you. (Canada) and winter in the south (Mexico). Ave. Weight (Adult): Up to 24 lbs. Nest: 15”-44” in radius, 4” deep, 10” where eggs are laid, lined with downy feathers. Found on the ground usually close to water. Eggs: Dull white to cream white. Twice as large as a chicken egg. Young at Birth: 3-4 oz. Yellowish brown and slightly feathered. 24 Hours: Able to swim. 8 Weeks: 7 lbs. adult colors in feathers noticeable. 9-11 Weeks: Able to fly. Feather Color: Long black neck and head with large white cheek patches, brown gray body, black tail, feet and bill. Musical Honking. Hiss and will chase danger away. Your Wildlife Professionals, Inc. has been providing geese identification in Virginia since 1998. If you need geese description, goose body size, goose average adult length, goose tail length, goose average adult weight, goose young at birth, average goose weight, average goose length, or goose voice & sounds in Alexandria, Arlington, Bedford, Blacksburg, Bristol, Charlottesville, Covington, Chesapeake, Danville, DC, District of Columbia, Fairfax, Fredericksburg, Hampton, Harrisonburg, Lexington, Lynchburg, Loudon, Manassas, Martinsville, Newport News, Norfolk, Richmond, Roanoke, Smith Mountain Lake, Staunton, Virginia Beach, Waynesboro, Washington D.C., Williamsburg, Winchester, Wytheville, and Yorktown Virginia, Your Wildlife Professionals, Inc. is available to solve your goose problem. Your Wildlife Professionals, Inc. considers both the time of year geese breed, when geese are born, geese gestation period, the number of geese born, geese weaning period, and the average reproductive age of geese within their respective geographic region of Virginia prior to controlling geese on your property in Alexandria, Arlington, Bedford, Blacksburg, Bristol, Charlottesville, Covington, Chesapeake, Danville, DC, District of Columbia, Fairfax, Fredericksburg, Hampton, Harrisonburg, Lexington, Lynchburg, Loudon, Manassas, Martinsville, Newport News, Norfolk, Richmond, Roanoke, Smith Mountain Lake, Staunton, Virginia Beach, Washington D.C., Waynesboro, Williamsburg, Winchester, Wytheville, or Yorktown Virginia. Time of Year: Late winter. Your Wildlife Professionals, Inc. provides geese removal on residential and commercial properties in Virginia. It is not always important to know everything about geese, but often clients need to know other information about geese in Virginia. Below is some additional information about geese, such as geese habitat, where do geese live, home range of a geese, geese food, geese habits, average life span of geese, and geese health concerns that you may want to know. If you live in Alexandria, Arlington, Bedford, Blacksburg, Bristol, Charlottesville, Covington, Chesapeake, Danville, Fairfax, Fredericksburg, Hampton, Harrisonburg, Lexington, Lynchburg, Loudon, Manassas, Martinsville, Newport News, Norfolk, Richmond, Roanoke, Smith Mountain Lake, Staunton, Virginia Beach, Waynesboro, Williamsburg, Winchester, Wytheville, or Yorktown Virginia and would like to know more about geese, please give us a call. Adaptable to any environment. Usually any area with suitable food, water and cover. Ponds, lakes, rivers, streams and agricultural areas. Feed mostly in the early morning and late afternoon. Graze on grasses, roots, seeds pond weeds, cattails, clovers, agricultural crops and leaves. Up to 23 years in the wild and 33 years in captivity. Your Wildlife Professionals, Inc. provide resident geese removal in Virginia. Resident geese have established local, non-migratory populations throughout Virginia. At one time geese were just a frequent visitor during the winter in their migratory route. Now they have taken up permanent residence in local lakes and ponds, parks, and golf courses. 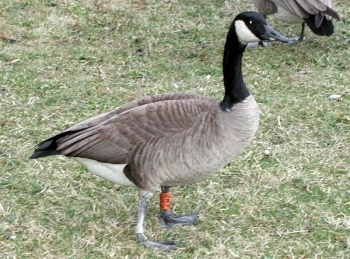 These local geese populations can damage and destroy agricultural crops and pose social problems in urban areas by nesting, feeding and defecating in the landscapes and lawns. Their droppings become unacceptable to people that frequent local parks and golf courses. There is a constant debate over the health issues with these droppings, in that there is not a direct link to any disease that can be contracted directly from them, but may lead to disease or parasite growth in the water where people swim. 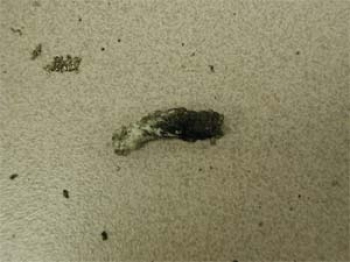 The droppings are unsightly and will gather on the shoes of the individuals walking around the parks or golf course greens. The defensive nature of nesting geese poses a threat to people that may get to close. The geese will often defend their nest by chasing anybody away that may threaten it. Some local lakes, parks, and golf courses have posted bans with fines on feeding the resident geese to help prevent people from being discouraged from using them. Your Wildlife Professional will design a geese control or removal program that best fits your needs and most importantly your budget. Understanding a geese biology or behavioral patterns, size, and reproductive rates is the most important factor in determining the proper bird control product to use. Some bird control products are species-specific, while others can deter a range of species. FlightControl® PLUS is our go to product that will deter geese, without having to physical remove the geese. 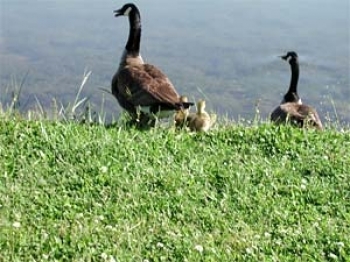 Resident geese are protected in Virginia and by the federal government, which means that we cannot start your geese management program during the nesting period or while flightless young are on your property. Your Wildlife Professionals, Inc., can design a geese control, geese removal, or get rid of geese by treating the turf area with FlightControl® PLUS to remove pest geese in the counties, cities and towns of Alexandria, Arlington, Bedford, Blacksburg, Bristol, Charlottesville, Covington, Chesapeake, Danville, DC, District of Columbia, Fairfax, Fredericksburg, Hampton, Harrisonburg, Lexington, Lynchburg, Loudon, Manassas, Martinsville, Newport News, Norfolk, Richmond, Roanoke, Smith Mountain Lake, Staunton, Virginia Beach, Washington D.C., Waynesboro, Williamsburg, Winchester, Wytheville, and Yorktown Virginia. For a FlightControl® PLUS treatment quote or other geese removal options, please contact Your Wildlife Professionals, Inc. for a bird consultation.